Apply one serving on either side of cut mark for preformed ropes. Apply two servings on either side of cut mark for non-preformed, parallel-closed and rotation-resistant ropes. Length of each serving should be at least equal to two rope diameters. Cut the rope with a high-speed abrasive disc cutter, flame cutting is not recommended. Maintain ventilation during cutting, use mask while cutting special ropes having synthetic material. Rotation – Resistant wire ropes resist rotation under load and hence these are specially designed for the intended purpose. 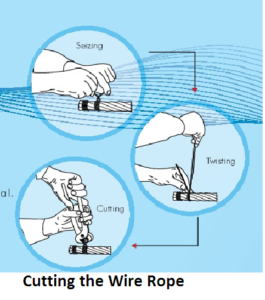 This unique feature, therefore, requires that extra care should be taken during handling, installation and usage of rotation-resistant wire ropes. These ropes cannot and should not be treated in the same manner as 6 or 8 strand preformed wire ropes.